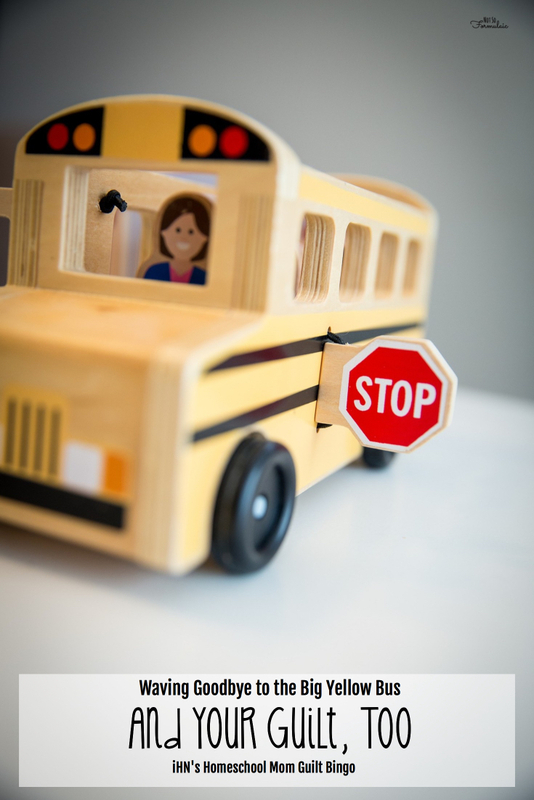 If you’re watching the school bus wistfully and chastising yourself in the next breath, stop. 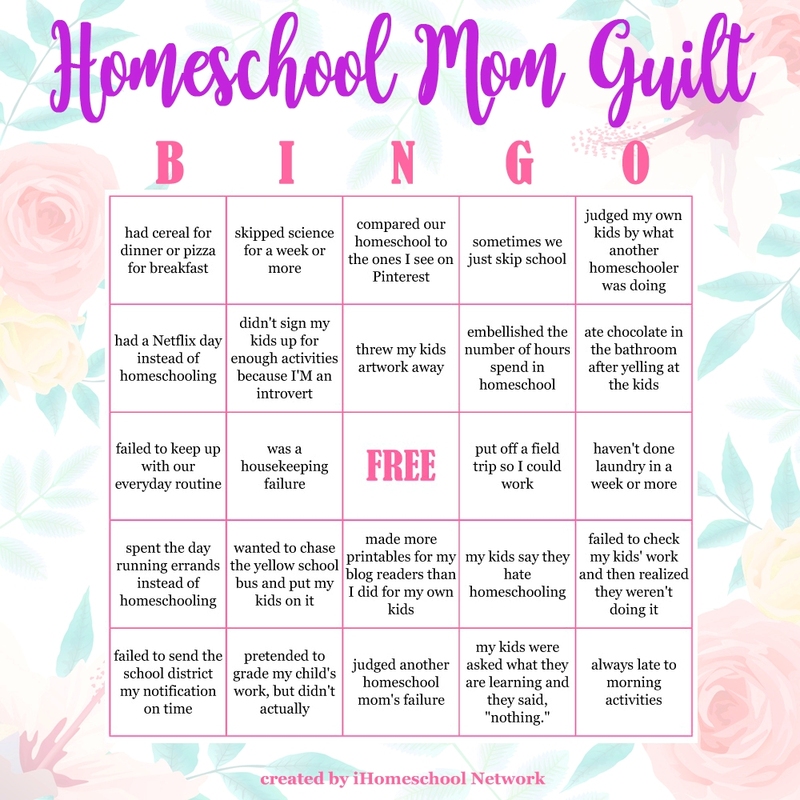 Wave goodbye to the big yellow bus, and your guilt, too (this post is part of iHN’s Mom Guilt Bingo). I had set the appointment for 10AM on a Friday, the first appointment of the day. Logic would dictate that, as homeschoolers, we would have the salon to ourselves. I’ve never been very good at logic. We arrived for our appointment at 10:07, frazzled from battling a nefarious pair of socks. Instead of finding the salon empty as I had anticipated, the door opened to two blonde poppets ensconced in protective capes. I studied their mom. She was trim, clad in expensive athleisure. Her skin was flawless: her hair in a neat pony tail. She oversaw each boy’s cut with steely precision: “A bit more here.” “Closer in there.” Neither of her boys made a peep. I caught a glimpse of myself in the mirror. My leggings had a small hole in the derriere (completely covered by my tunic, but still.) Peanut butter decorated the corner of my mouth. Damp hair fell in great, tangled swaths, overdue for a cut of its own. And my toddler son was pulling every balloon-on-a-stick out of the giant, hooray-you-survived carousel. I turned to correct him, forgetting I had set my bag next to me on the checkered tile floor. I tripped, knocked the bag’s contents to the four winds, and stifled a crazed shriek. A dozen red balloons bounced around me, aided by my overly enthusiastic mop-headed marauder. His sisters remained oblivious to my plight: one rummaged through a pile of overpriced Beanie Boos while the other fixed her gaze on a television screen. As I scrambled after my son, his various balloon friends, and the upended contents of my purse, I had some thoughts. None of them were good. None of them were alleviated, either, by the completion of the other two boys’ haircuts. They climbed down from their chairs as I stood by the balloon tree, painstakingly replacing each scarlet globe. Both of them wore t-shirts emblazoned with a seahawk – the local elementary school’s mascot. And not for the first time, I wanted to send my own children with them. 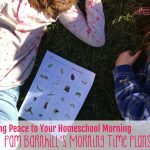 Homeschooling is the most difficult, rewarding job I’ve ever had. While I know the benefits outweigh the drawbacks, that sneaky, grass-is-greener voice snakes its way into my heart with more frequency than I’d like to admit. My first grader still can’t read. My fourth grader struggles with math. My toddler struggles with not wrecking my house. If I sent them off for eight hours a day (three for the little guy), maybe the older two could get past what ails them, and I could get past what ails me. The kids would have a normal, work-at-school life, complete with socialization. I’d have a normal, work-from-home life, complete with office hours. It seems like a rational solution. But as often as I’ve owned up to this feeling, I keep coming back to a text from my husband, sent in response to a dramatic missive about my desire to throw the kids on the bus. 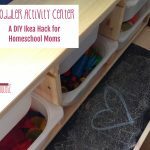 I had the dreaded mom guilt monster breathing down my neck, and I told him so in no uncertain terms. He just said okay. Because truthfully, it is. Stick to the mission and we will get through. 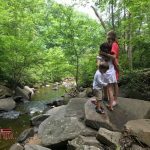 We are moms first, and homeschooling moms second. Our mission is to love our and support our children as best we can – whatever that means at the moment. 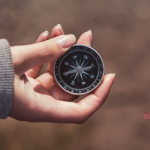 For the vast majority of us, that means taking a deep breath, a step back, and a second (or two) to ourselves emerging secure in our confident vocation as our children’s primary educators. And for some of us, that means making peace with the knowledge it might be time to move on. It does not mean feeling guilty about contemplating change. It does not mean feeling guilty about doubting our path. It does not mean feeling guilty about wanting a break. We are human. We have our own needs. And just as our kids need us, we need us, too. If you’re watching the bus stop wistfully and chastising yourself in the next breath, stop. Recenter with prayer, meditation, a supportive, good read. Renew with a day trip, a weekend getaway, an outdoor excursion (alone or with the kids). Restore your relationships with read-alouds, long walks, sports, or crafts. Reevaluate your curriculum, your schedule, your approach. Resist comparing yourself to the next door neighbors. Recharge your batteries, and go easy on yourself. Stick to the mission, and you will get through. 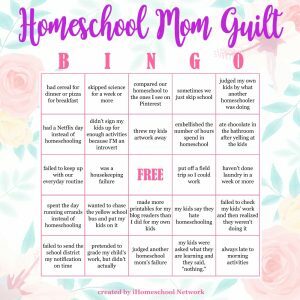 This post is part of the iHomeschool Network’s Mom Guilt Bingo. I’m pretty sure that those tips work for any family decision. Thanks, Ginny! Bookmarking via Pinterest for reference. I KNOW I’m going to need to revisit this! We shouldn’t feel guilty for wanting a break. 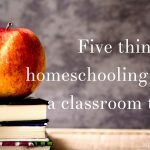 I think we homeschool moms are too hard on ourselves. I really needed to read this today! I have been discerning whether or not to continue homeschooling after we move. I LOVE your husband’s calm and supportive response. I have threatened my children with the school bus many a time throughout 11 years of homeschooling. Each time I feel guilty and vow not to do it again. Some days are hard, even when they get older. They become pig headed teens who think they know it all! That was hilarious…and I’m sorry. Been there. And, I love your husband’s response. “Stick to the mission and we will get through.” I absolutely love that. Hey! My first grader still can’t read, and my fourth grader struggles with math too 🙂 I’ve even got the toddler thing happening around here some days too, though thankfully she’s turning more into a “preschooler” now. 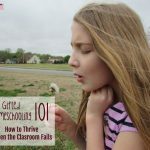 I’m so thankful that my husband has never suggested with send the kids to school when I’ve vented to him about our bad days, struggles or failures. It’s so nice to have a supportive husband! Thank you so much for this post, you can’t possibly know how much I needed it. You are so welcome. I imagine we all need it from time to time.